Hailing from Alessandria, in north-western Italy, Loreweaver began their career in 2008, when vocalist Barbara Rubin (a classically-trained violinist) joined a quartet of musicians that had been playing together for some time – guitarist Francesco Salvadeo, keyboardist Lorenzo Marcenaro, bassist Giordano Mattiuzzo and drummer Andrea Mazza (later replaced by Claudio Cavalli). Imperviae Auditiones (which in English sounds more or less like “difficult listening”) their recording debut, was first released in 2009 by the band themselves; then, in the spring of 2011, after Loreweaver got signed by SG Records (an Italian label specializing in heavy metal, punk and alternative rock), the album finally got an official release. As my readers may know, I am not a fan of progressive metal, and most of my contacts with this subgenre have been through reviewing rather than personal choice. In particular, anything that might remind me of subgenre icons Dream Theater leaves me quite cold. 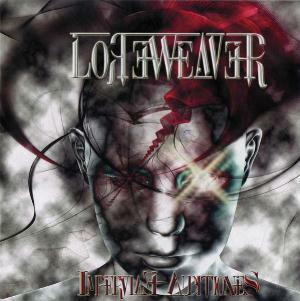 However, I also pride myself on being as objective as possible, and, even if an album may not be my listening material of choice, I make a point of giving quality its due – and Loreweaver’s debut, in spite of the almost inevitable rough edges, is quite a remarkable effort. While Italy is home to an impressive number of progressive metal bands, the genre is somehow perceived as “foreign”, and not only on account of the widespread practice of using English for both lyrics and band names. In the Eighties, a few Italian metal bands adopted their native language, but nowadays this trend seems to have faded almost completely. The choice of English is undoubtedly crucial for all those bands that want to travel outside their home country and make a name for themselves on the international market (as fellow Italians Lacuna Coil did with unqualified success). This strategy certainly helped Loreweaver, whose appearance at the 2011 edition of the Fused Festival in Lydney (UK) drew a lot of attention to this distinctive version of a female-fronted prog-metal band. Indeed, Loreweaver’s ace in the hole, the single factor that prevents them from sounding just like another of the many Dream Theater disciples, is the presence of Barbara Rubin behind the microphone. My first contact with her came in 2009, when I reviewed her debut solo album, Under the Ice, and was impressed by her voice, a warm, self-assured contralto with enough versatility to tackle both out-and-out rockers and gentler, more intimate pieces. On a music scene overrun with pseudo-operatic wailers or cloyingly sweet, cutesy sopranos, Barbara’s clear, powerful pipes sound refreshingly different – as does her avoidance of either femme-fatale or tough-chick affectations. Her classical training has clearly influenced her singing technique, and her voice sounds perfectly in control, negotiating the often wild shifts in tempo and mood typical of the genre in an almost effortless, authoritative manner. Although her voice is unmistakably feminine, her approach is more masculine, steering well clear of mawkishness and saccharine-sweetness even in the obligatory, piano-infused power ballad That Night. Indeed, Rubin comes across as a heavier version of Janis Joplin or Grace Slick rather than yet another Tarja Turunen clone, decked in corsets and lace. The songs, all between 6 and almost 10 minutes (with the exception of the lone instrumental Ride the Own, at barely over 4 minutes the shortest track on the album), blend riff-driven heaviness with synth sweeps, eerie electronics and occasional bouts of mellowness provided by piano and acoustic guitar. Bogus kicks off with a slice of classic of prog-metal, in which the hissing synthesizers and inevitable spots of rapid-fire drumming receive a welcome injection of remarkably un-cheesy melody from Rubin’s powerful, yet astonishingly controlled vocals. In Dead Man Walking an atmospheric, slightly sinister component prevails, with Rubin’s voice alternately soothing and shouting, and Francesco Salvadeo’s sharp, clear guitar solo drawing things to a close with just a touch of shredding; while De Rerum Natura is grandiosely dramatic, with so many changes to make the average listener’s head spin, veering from doomy slowness to a more upbeat, dance-like pace. Follow the Weaver, on the other hand, seems to take the contrast between melody and aggression to extremes, with an airy, melodic middle section decidedly at odds with the rest of the track. Avoid Feelings has a similar structure, though more nuanced, and lashings of whistling, wheezing sound effects offset by wistful piano. The album is then wrapped up by the sci-fi-tinged epic Ultraworld, complete with ominous recorded voices and strident electronics, and propelled by Rubin’s sensational vocal performance, whose intensity is paralleled by the smooth guitar-keyboard interplay. Professionally packaged with suitably disturbing artwork, liner notes and lyrics (which are, however, somewhat difficult to read), Imperviae Auditiones does not stray far from the template, of “traditional” progressive metal, either musically or lyrically. However, Barbara Rubin’s vocals are enough to make a difference, and attract the interest of those fans of the genre that are a bit weary of run-of-the-mill, Gothic/symphonic bands fronted by the token siren-voiced temptress. Loreweaver are a promising band with the potential to develop an even more personal sound in their future releases.